So last semester I did a project for a fiber arts class that included a strip of fabric about 50 yards long and 5 inches wide. And honestly, I'm not to the point where people are collecting my school assignments, that will come later in about 15 years i'm sure haha. It's been wound up in my closet ever sense. 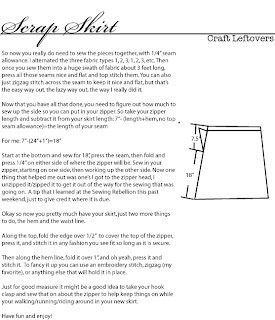 So this skirt takes care of some of it, but I seriously might need to make about 20 more to use it all up! Oh I added larger reusable tea bags for tea pots and herbal bath infusions and crocheted head wraps to the etsy shop. I'm going to try to add some other stuff this week, but we will see how that goes, finals are in 2 weeks and it's that freaking out time. Oh, I love it! So well thought out. And for anyone wanting to make a LONG version of the skirt, you need more flare to get the same effect on a longer panel. Just a thought. Yeah, that is a really good idea. 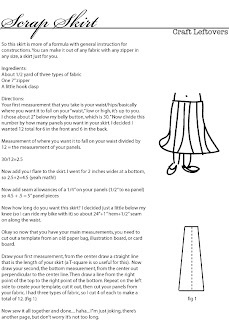 You know, the more I thought about it, the more I think that the bottom of the skirt should be at least twice the circumference of the waist measurement. So 30 inch waist, at least 60 inch bottom.... so into 10 panels 6 inches at the top and 12 at the bottom.... and like mirawyn says, if you want it longer than knee length, a larger bottom measurement would be best. Hi! 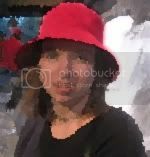 - Wanted you to know that I just posted an adaptation to your pattern on my blog. Thanks so much for the inspiration, it's a GREAT idea!!! !